The Cargo wagon is used in conjunction with locomotives to form trains for the railway. A wagon is used to transport items and can be filled and emptied like a chest, but with many more inserters at the same time. Up to 12 inserters per wagon are possible (from both sides). The inserter item stack size is important to fill the wagon fast! In manual-mode cargo wagons can only be filled or emptied when they are not moving. In automated-mode it is the same, but additionally they can only filled/empty, when stopped on a train-stop (not at a signal). 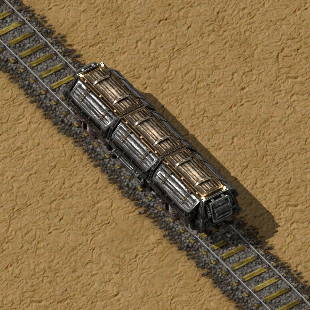 A spot where inserters are positioned to transfer cargo for wagons is called a train station. Wagons have a stack limitation option the same way chests do, which can be used to limit the number of transported items. Each stack in the cargo wagon can be filtered. This works in the same way as the quickbar; the default key to define or remove the filter is the middle mouse button. Players can enter a cargo wagon and control any connected locomotives. A cargo wagon can be filled with 2000 items of ores (copper, iron, ...) or 4000 items of processed plates (Copper plates, iron plates, ...). This can make preprocessing of ores into plates near the mines a useful strategy, because the transport of plates is more efficient. Stack size is not the only factor to consider when comparing train transport of preprocessed items to raw items. Some raw items craft into a smaller amount of processed items. One example are iron plates, 5 iron plates can be crafted into 1 steel plate which means that when transported by train, the throughput increases by 5 times. Cargo can be transferred with many more inserters than with a chest, bypassing the limitations of the inserter stack size bonus. Items are transported instantly over the length of the wagon. Correctly configured, this is faster than a transport belt. This page was last edited on 14 March 2019, at 05:12.